Ok so the end of August has definitely popped up a lot sooner than I was expecting. I was thinking I had about another week until I needed to sit down and think about my favourites from this month. Luckily I actually looked at the calendar and released that September is just around the corner (and hopefully so is Spring!). Anyway, I am starting to ramble. Let's take a look at all the things I have been loving this month. This month has definitely seen a lot more swatches (and wearing plain manis) than nail art. There isn't a particular reason for this (well apparently from having lots of new pretty polishes to swatch) other than I just haven't done much nail art. Next month will be a different story though. 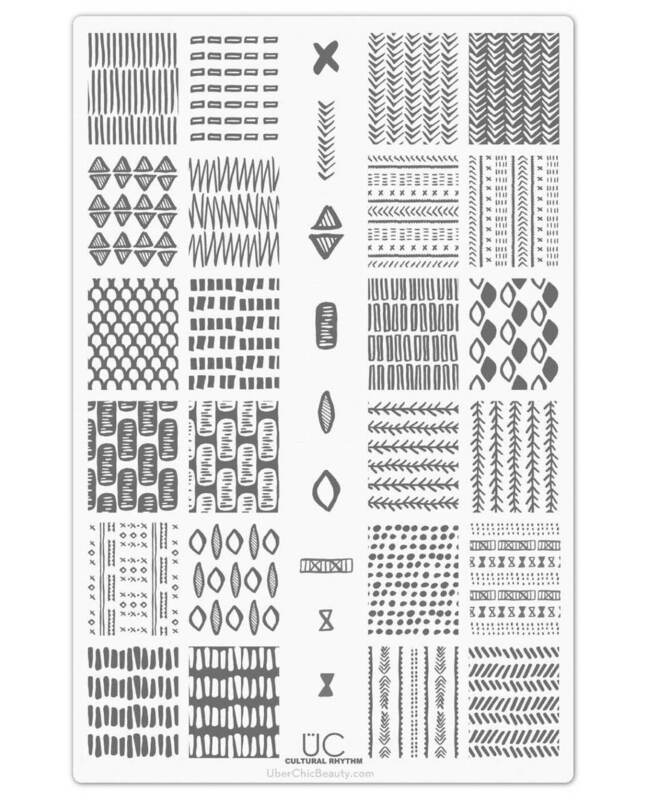 This month I have only played with three stamping plates. One plate is a plate that I have had for a very long time. I don't even recall when I purchased it. I'm guessing it was earlier this year. 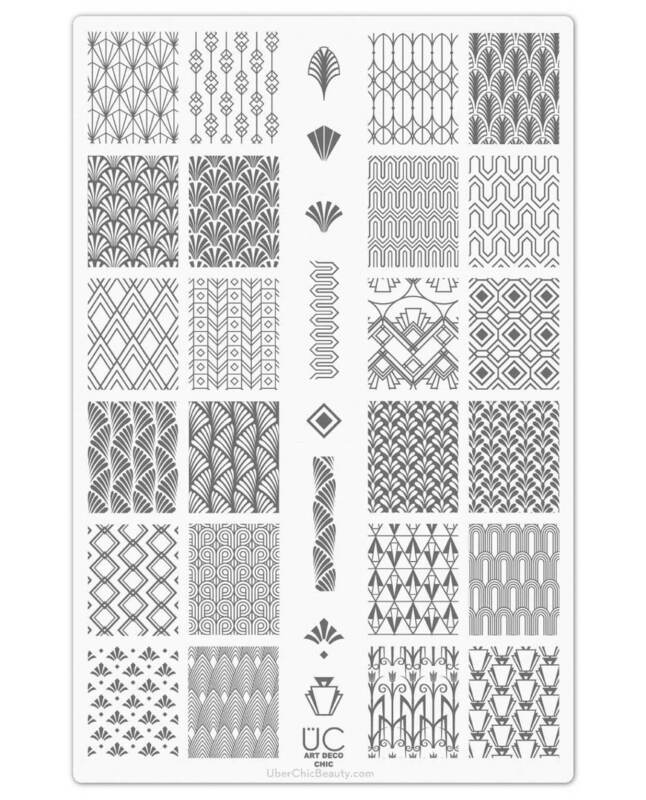 Anyway, I also had the pleasure of swatching two of Uberchic's new plates - Cultural Rhythm and Art Deco. This is definitely my favourite of favourites of the two new plates. I think the images are more my style and I can see me getting a lot of use out of this plate. I went a little back and forth about whether I should include this plate in my favourites list. Why? Looking at the images I don't particularly love the designs, but for some strange reason I love them when I use them. It's really quite bizarre. 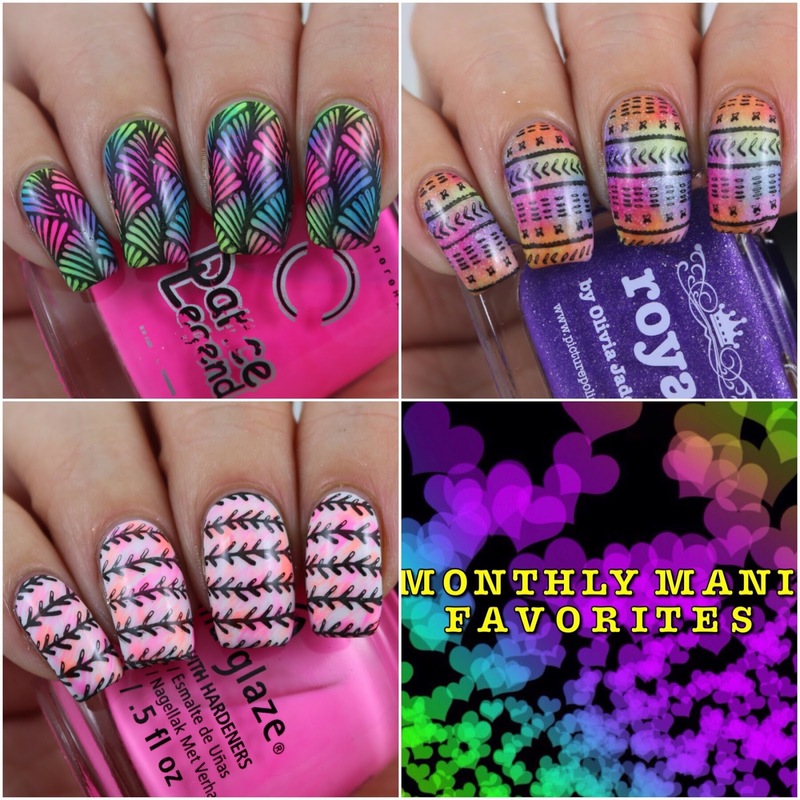 Two of the three manis from my nail art favourites are from this plate! I have played with quite a few mainstream polishes this month but sadly there isn't really many polishes that got my heart singing. I got in a little early with posting China Glaze Halloween's Collection but I am ok with that. It gives you guys plenty of time to grab any of the polishes that you are interested in. I really like the entirely collection and I think that it's really cool that China Glaze did an entirely black collection. My absolute favourites from this collection are Night And Slay, and Pret-A-Potion (I particularly love it over CG Chic Happens). In terms of favourite mainstream collections I have tried this month, the Color Club Halo Crush Collection is hands down my favourite. 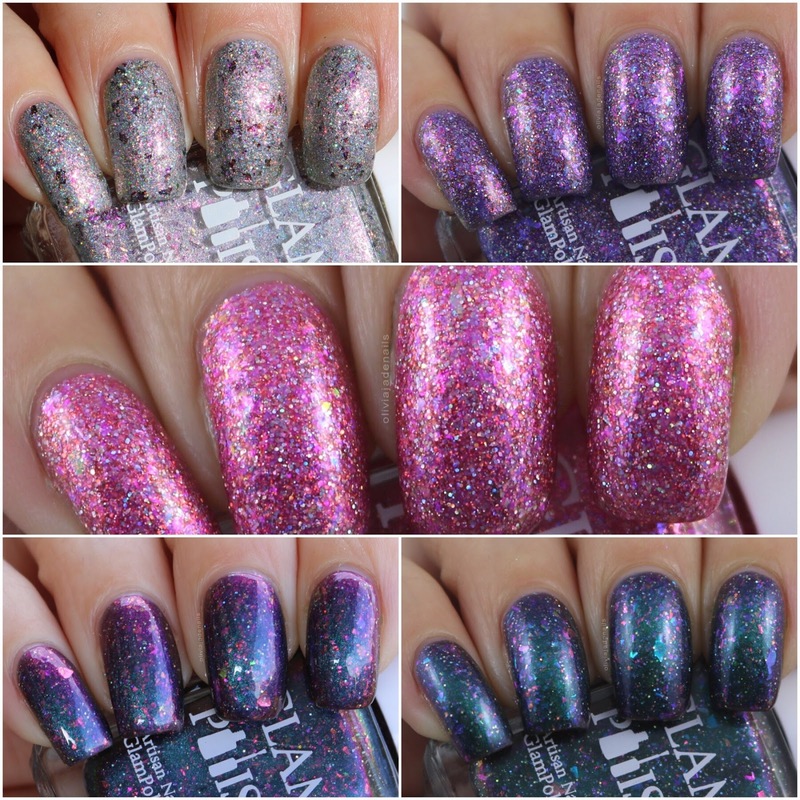 The formulas are good, they are really sparkly and the colours are really nice. My personal picks are Break It Up, I've Got A Crush, Piece Out and Shattered. It probably comes as no surprise that indie polishes have made up most of my blog posts again this month. There is always so many good things that come from the indie girls. 3 Words, One Song is from this month's Polish Pick Up. It's seriously stunning! I don't think pictures do this polish justice. Emily de Molly have done it again this month! So many gorgeous polishes were released. I am definitely going to have a really hard time narrowing down my favourites at the end of the year. Anyway, my personal favourites from this release are The Maze And The Hightower, Dancing Through Sunday and Memories Of Midnight. These definitely took me way too long to get around to swatching but I am so glad that I finally did. While I did like all four of the polishes, I particularly fell in love with LE98 and LE99. 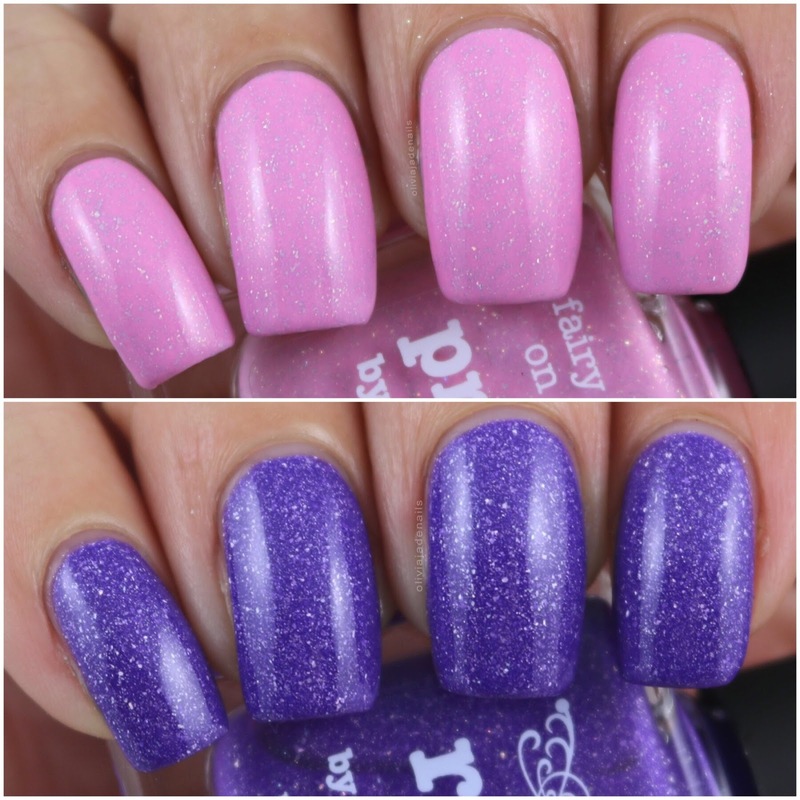 This month I had the pleasure of swatching the new Pixie Dust Collection from Glam Polish. It's such a pretty collection. My personal favourites are A Girl Worth Fighting For, Faith, Trust And A Little Bit Of Pixie Dust, Tale As Old As Time, Wish Upon A Star and I Just Can't Wait To Be King. Magical Muse was released as part of this month's Polish Pick Up and I love it! It's gorgeous in both it's cold and warm states. Grace-full have killed it this month with their releases! Shakin' All Joker was part of the Hella Handmade Creations this month and it is gorgeous! Pictures don't really do it justice. Yet another polish that was made as part of the Polish Pick Up, except this polish was actually released back in June. I absolutely love this polish! It's easily one of my favourite polishes that Lilypad have made! I know I have said this before (and I'll probably keep on saying it) piCture pOlish is one of those brands that I never know which category to put it in. They really aren't quite and indie brand but they aren't mainstream either. Anyway, this month I finally got around to swatching the rest of the polishes that were released along side my collaboration shade. My favourites from the release definitely Royal (which if you didn't know is my shade) and Princess. 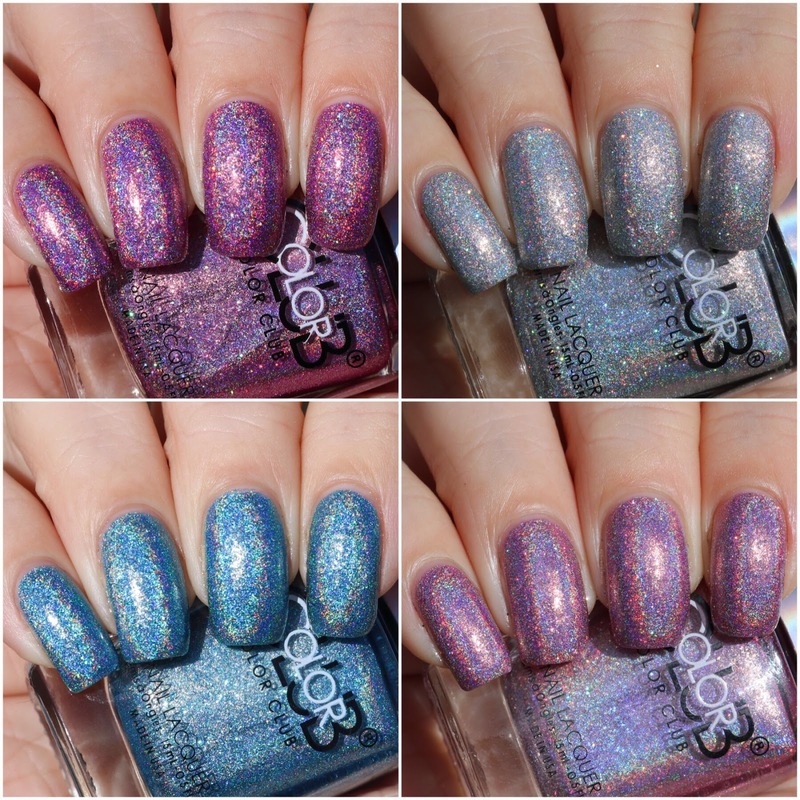 Back in June I posted Color Club's Halo Chrome Collection (you can see that post here if you are interested) and I think I mentioned that I also had the Halo Crush Collection. Sadly, I haven't had the sunshine or the time to swatch and review this collection....until now! Woohoo! 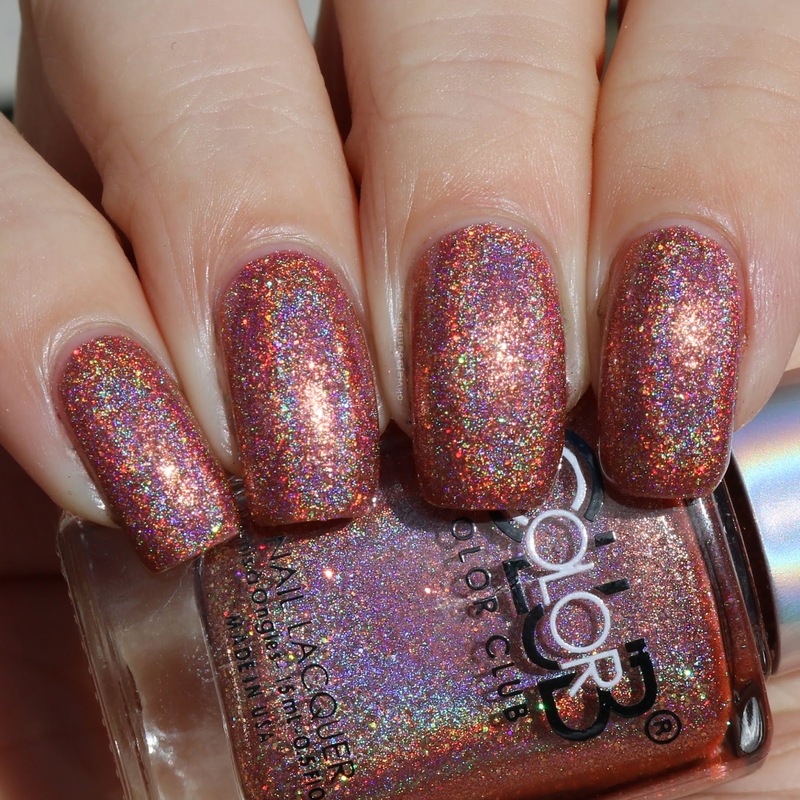 I can't wait for Spring to arrive so that I have more flexible to play with holo polishes. Anyway, before I start babbling, let's take a look at the new (well new-ish) Halo Crush Collection. This is quite a consistent collection so rather than me repeating myself over and over I figure I will just some it up before looking at the individual polishes. 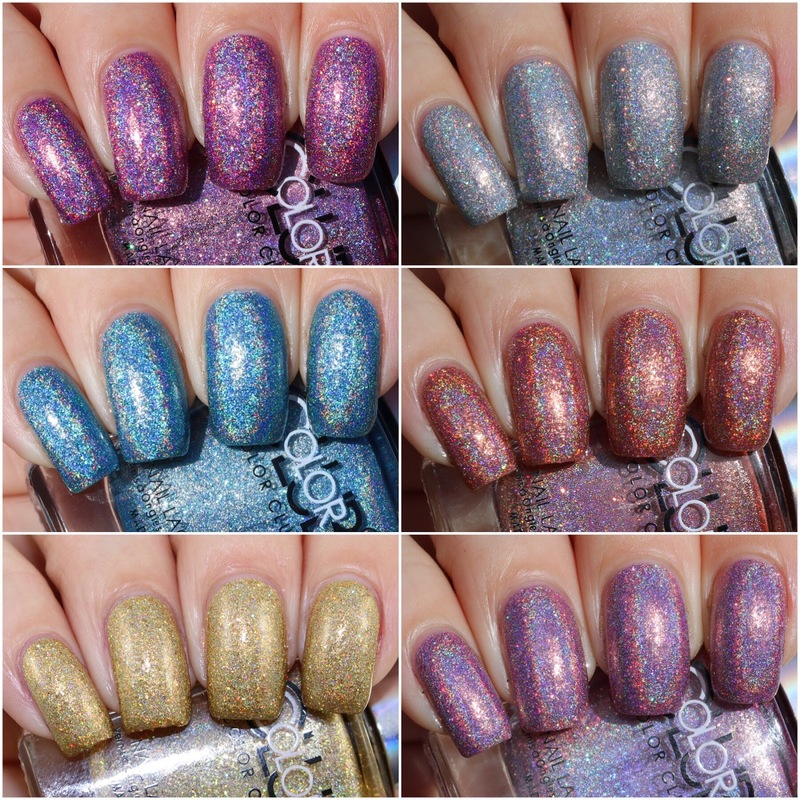 All of these polishes have a linear holo base with larger holographic glitters throughout. The formula of the polishes are easy to use and are really sparkly. I don't think pictures really do these polishes justice. All swatches are of two coats. Back To The Grind is an orange holographic with glitters. Break It Up is a silver holographic with silver holographic glitters. I've Got A Crush is a pink holographic with pink holographic glitters. Piece Out is a blue holographic with blue holographic glitters. Shattered is a purple holographic with purple holographic glitters. Smashing Review is a gold holographic with gold holographic glitters. I am a really big fan of this collection. I mean they are sparkly and holo, what's not to like? In terms of the colours in the collection, there are two that aren't my favourites (Smashing Review and Back To The Grind). There isn't anything wrong with either of these colours, they just aren't for me. I also wished that there was a little more of a colour difference between I'm Crushing On You and Shattered. They are both very similar - I actually thought that I was sent two of the same polish when I first got them. Anyway, all that said my favourites from this collection would be I've Got A Crush, Shattered, Break It Up and Piece Out. What do you think about the Halo Crush Collection? Happy Sunday everyone! I hope the weekend is treating you all nicely. We have had lots of sun which has been nice for a change. I am definitely looking forward to Spring! 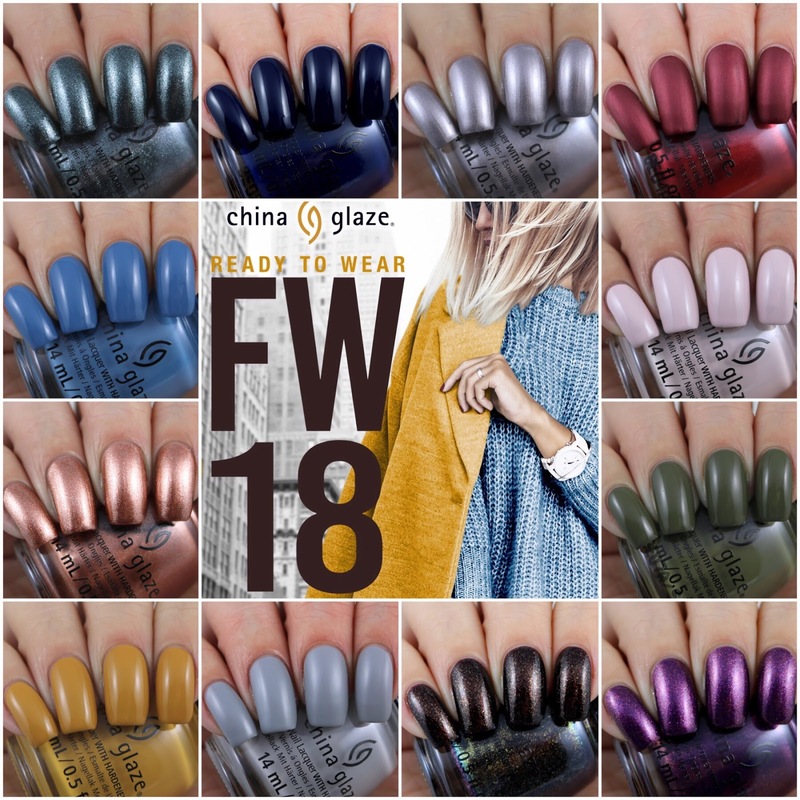 Anyway, earlier this week I posted this years Halloween Collection from China Glaze (you can find it here if you missed it) and today I have their Autumn/Fall collection - Ready To Wear. Aut-Umm I Need That is described as a brown-gold shimmer. 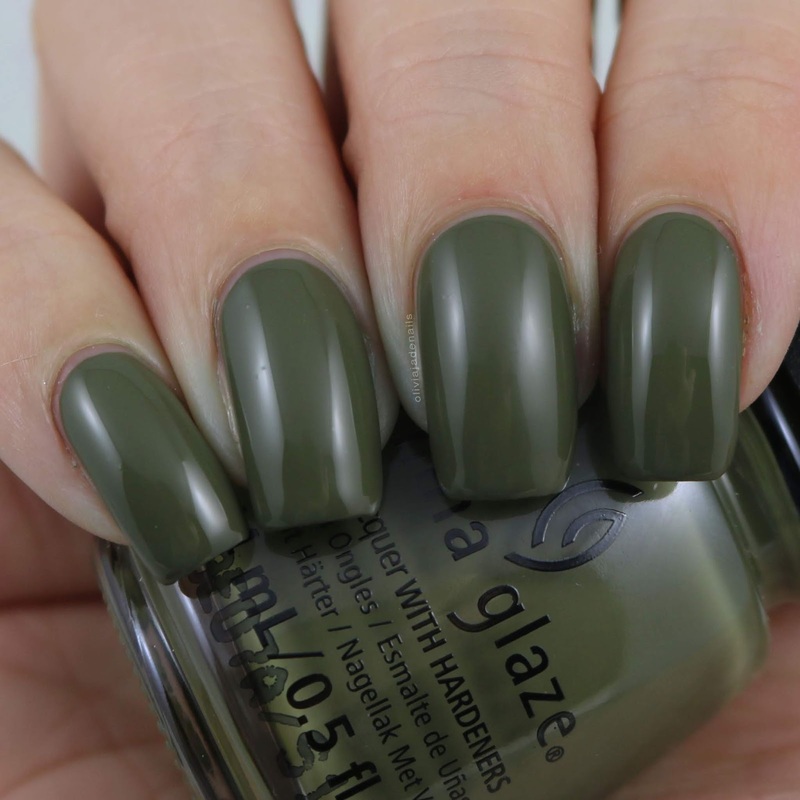 I really like the look of this one in the bottle but unfortunately I don't really like it on the nails. It looks so much sparklier in the bottle. Anyway, the formula is great and is opaque in two coats. Central Parka is a camo green creme. If you know me I'm really not a big green fan. That being said, this camo green is so cool. I actually wore it as a full mani and really liked it. I think it would also look cool matte! The formula is awesome - you could easily get away with one coat. My swatch shows two coats. 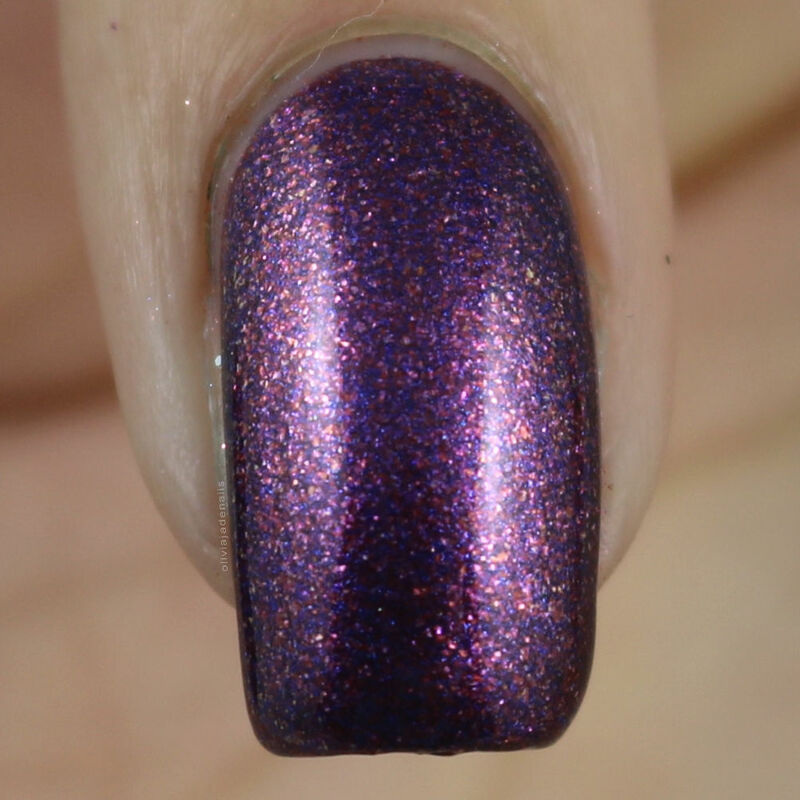 Chic Happens is described as a purple-grey metallic. This is a really pretty colour. I like that it's not completely purple or grey. It really sits somewhere in the middle. It's definitely unique in my collection (unless there is a metallic that I have forgotten about). The formula of this one is easy to use but I did find this one to be slow drying (when you compare it to other metallic polishes). It also has slight visible brush strokes in it. My swatch shows two coats. Haute Blooded is described as a dark red matte. I really, really like this one. I'm not normally one for reds but there is something so pretty about this one. It is perfect for the cooler weather! The formula is easy to use and applies evenly. I used two coats for my swatch. Mustard The Courage is described as a mustard creme. I don't like this colour at all, however I think it will be great to use in nail art. The formula is easy to use and is opaque in two coats. 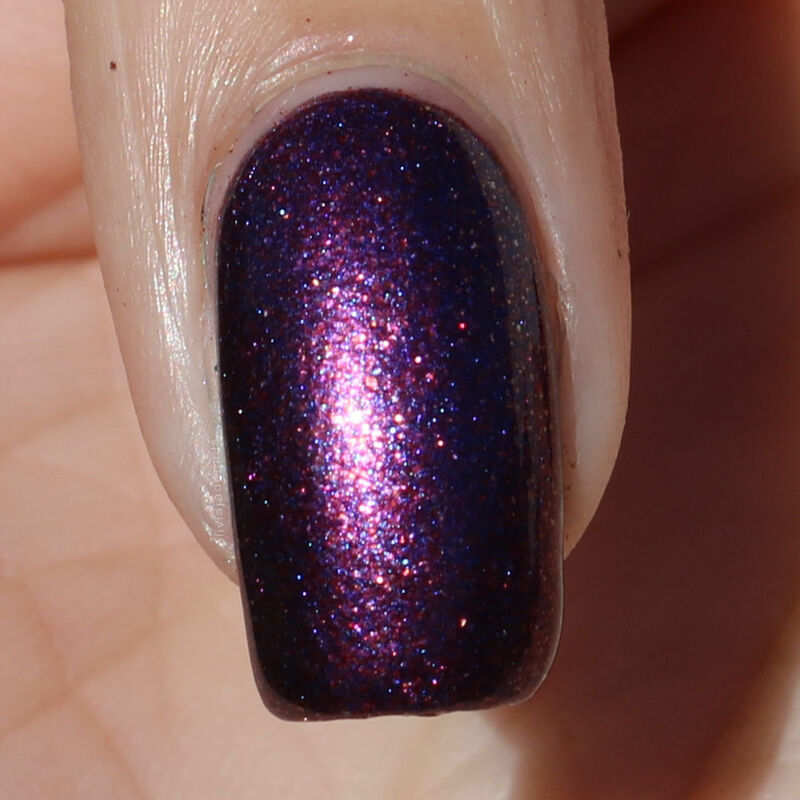 Pay It Fashion Forward is described as a purple glitter. This is a pretty colour but the formula isn't the greatest (and definitely not what I was expecting). It is quite runny so comes flying off the brush so definitely watch out of that! I used two coats for my swatch. Pleather Weather is described as a light grey matte. Given the formulas of the other matte polishes I have tried from China Glaze I was expecting so much more from this polish, but sadly it's quite sheer. I did use two coats, however I really should have used three coats. Sample Sizing Me Up is described as a blue creme. I quite like this blue. It's not necessarily my favourite type of blue but I do like it. It's a different spin to the usual navy blues you see in Fall collections. The formula is great and you can easily get away with one coat. I used two coats for my swatch. Swatch Out! is described as a copper shimmer. This one I wasn't loving when I put it on but it did grow on me the longer I had it on (I wore it as a full mani). The formula is good and is opaque in two coats. Throwing Suede is a soft blush pink creme. This one is a nice colour but as expected the formula is uneven on the first coat. I used two coats for my swatch, however I seriously question if I should have done a third coat. Vest Friends is described as a green-grey shimmer. The formula is quite runny so a careful application is needed. The colour and shimmer is nice. My swatch shows two coats. You Don't Know Jacket is described as a navy blue creme. This really is just your standard navy blue creme. There isn't anything wrong with that, it's a nice blue. The formula is great. You can easily get away with one coat, however I used two coats for my swatch. Overall, I think this is a good Fall collection (there are some really nice polishes) but it's not a collection that makes my heart sing. What do you think of this collection?